President Trump on Wednesday signed into law a bill that guarantees about 350,000 furloughed federal employees back pay once the partial shutdown ends. The House and Senate last week passed the 2019 Government Employee Fair Treatment Act, which ensures back pay for furloughed workers and mandates that the roughly 500,000 employees working without immediate pay during the shutdown are able to take previously scheduled leave without consequence. Governmentwide guidance had required agencies to cancel leave for those workers. Excepted and exempted federal employees who work during a shutdown are already guaranteed back pay by law. Furloughed workers have historically always received their paychecks retroactively, but Congress must act affirmatively to ensure that happens. The measure requires agencies to make employees whole “at the earliest date possible after the lapse in appropriations ends,” regardless of the timing of the next pay period or when the next round of paychecks is scheduled to go out. The bill was written to ensure back pay for furloughed feds in future shutdowns as well. Maryland Democratic Sens. Ben Cardin, who introduced the measure, and Chris Van Hollen led the charge for passing the bill. Trump has repeatedly sought to minimize the impact the shutdown is having on federal workers, saying they will “make an adjustment,” can ask for relief from their landlords and don’t mind missing paychecks because they support his proposed wall along the U.S.-Mexico border. He has alternatively said they support his shutdown fight (despite data to the contrary) and that virtually all of those affected are Democrats. Some lawmakers are pushing for additional back pay legislation to ensure that contractors going without pay also receive compensation for their time off. The 2019 Low-Wage Federal Contractor Employee Back Pay Act (H.R. 339), introduced by Del. 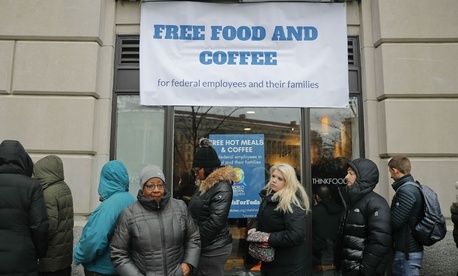 Eleanor Holmes Norton, D-D.C., would compensate contractors who provide retail, food, custodial and security services at federal agencies shuttered during the partial government shutdown. Norton introduced similar legislation after the 2013 government shutdown, but it never received a vote. A similar bill has been introduced in the Senate. Thirty-three Democratic senators wrote to Office of Management and Budget acting Director Russ Vought last week, pushing him to direct agencies to work with contractors to ensure those workers receive back pay when the government reopens. Need more information or close to retiring, let us help guide you through the process. Request more information! Anonymous on Should FERS Employees Depend on the Special Retirement Supplement To Determine When to Retire?